With charms including the Golden Mile of jewellery shops to the National Space centre, the East Midlands city could be worth exploring when looking for a first home. When it comes to buying a first home, it's often a trade-off between location and price. More often than not, it comes down to what you can afford based on how much you have saved for a deposit, how much you earn, and how high your outgoings. But working out the finer details isn't always straightforward. This is where Zoopla can help. Our data looks at average house prices to show how much a first-time buyer needs to earn and save for a deposit to buy a home in the UK. If you’re looking for the best places to live in Leicester, our map, below, shows you the areas that are most affordable for first-time buyers. The average first-time buyer property (two-to-three-bedroom house) in Leicester costs £183,989, with the average deposit required being £27,157. The average income required from a first-time buyer household is £39,208. While Leicester is not expensive by UK standards, affordability is still be stretched for many living in the area and looking to buy locally. The lowest house price to local earnings ratio is 5.51 in LE1, the city centre. But with most banks and building societies only prepared to lend up to four times annual income, a home could still be out of reach. 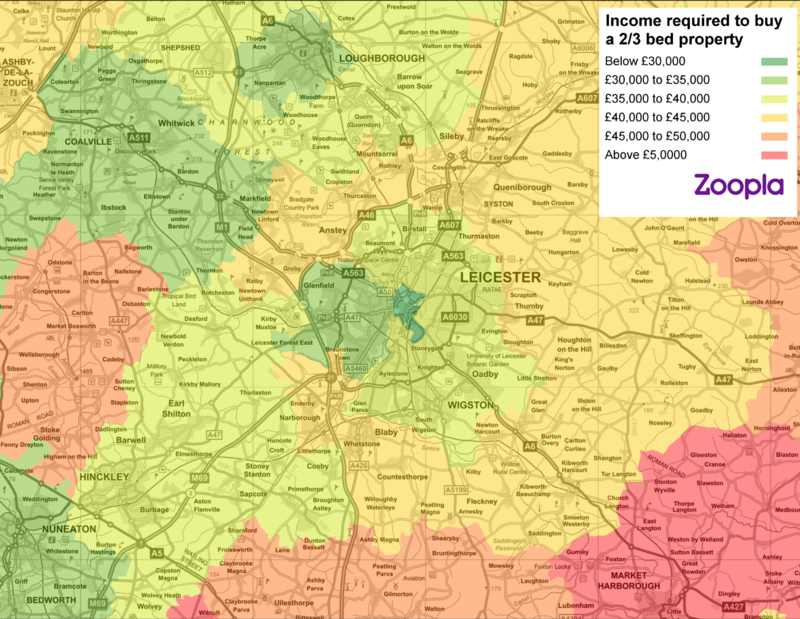 Unlike many other urban areas, Leicester has a fairly equitable spread of affordability for first-time buyers. This suggests that those with a large enough deposit and who can afford mortgage repayments, can opt for a relatively wide choice of locations. The most affordable place to buy is the city centre (LE1), with an average property price of £125,602. Braunstone, Glenfield and New Parks (LE3) is next on the list, with average prices £157,493, but, encouragingly, all the top 10 most affordable postcodes come in under £200,000. How have we calculated it? We've looked at the average price of two-to-three-bedroom homes - the most common type of property purchase for first-time buyers in all Leicester postcodes. We've then taken the average mortgage advance from lenders in the region and worked out both the average deposit required and the amount that needs to be earned based on buyers being able to borrow up to four times their salary. How can I afford a home as a first-time buyer? Your first step will be to build up as big a deposit as possible. This allows you to borrow a lower percentage of the overall value of the property and means you can gain a better mortgage rate. Try to save at least a 10% deposit. While it is possible to put down less in some cases, the compromise is either higher monthly repayments or a longer-term mortgage. The Government's dedicated Help to Buy schemes are there to help you become a homeowner. For certain property, you can also use the Equity Loan scheme, where the Government will lend you 20% of the purchase price interest-free for the first five years. However, you will only be able to use it on a new-build home valued up to £600,000. Provided your credit score is in good order and your outgoings to do not limit your ability to repay a mortgage, banks and building societies will lend up to an average of four times your salary. If you are buying as a couple, then combining your incomes could have an impact. Once you’ve established how big your deposit is and how much you might be able to borrow, you’ll have a good idea of your budget. Then you can start the exciting part of the process and begin house hunting. Don’t forget that there will be other fees that pop up along the way, such as solicitor and moving costs. The good news is that stamp duty land tax is waived for first-time buyers on the first £300,000 of the purchase. For more help purchasing your first home, read our first-time buyers guides here. Homes for first time-buyers in the East Midlands cost £174,301 on average, requiring a deposit of £25,727 and a household income of £37,144. This makes Leicester slightly more expensive than its surrounding area. Affordability is eased if you head west from Leicester to Tamworth and Nuneaton and even more so by heading north of Nottingham to Mansfield and Worksop. Head south to Warwickshire, Northamptonshire and Cambridgeshire and property prices start to rise considerably. 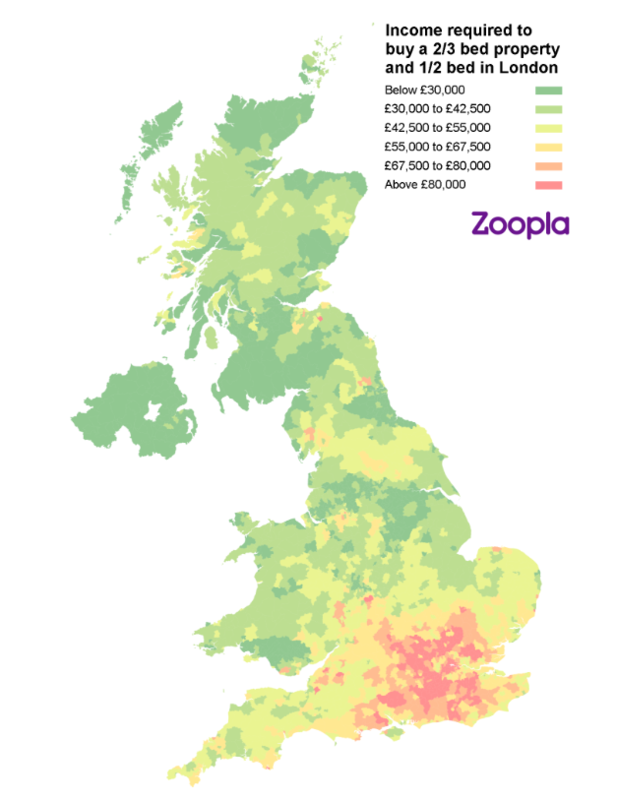 If you're prepared to cast your search further afield, then our first-time buyer affordability map of the UK, will help. 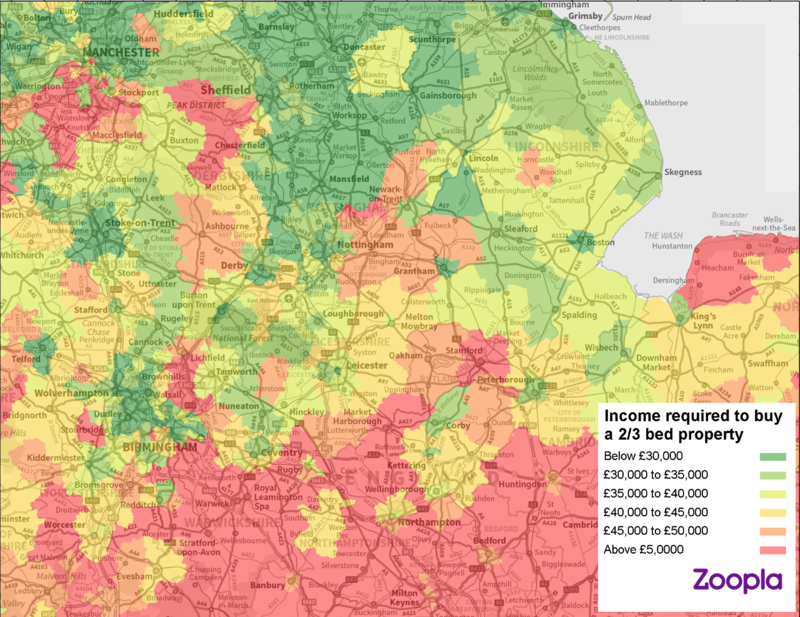 There are still plenty of areas where those with household earnings of under £30,000 can afford property, especially if you head to the North. While the UK-wide map might provide a helpful overview, it's also worth noting that the property market varies on a far more local level and you really need to take a closer look at specific locations, like we've done with Leicester, above to seek out value. Full methodology: House prices taken from a subset of Zoopla-partner Hometrack's stock valuation database (one-to-two beds for London and two-to-three bedrooms for rest of UK). Median price calculated as of June 2018. Median advance taken by region (c75% for London, c85% outside of London) from UK Finance. Term of Mortgage: 25 years. Interest rate: 2.00%. Loan to income ratio: 4.0. Earnings required for affordability is greater of those required to satisfy loan-to-income threshold or income required to service the mortgage.